Do you have a broken sunroof glass? Should you find something odd about your sunroof, go the car repair shop as soon as you can. Below are the things you have to watch out for, some red flags that you should never dismiss. The slightest of crack today could lead to a totally shattered glass tomorrow. Do not waste valuable time by dismissing even just a hairline crack on your sunroof. Chances are, if you bring it to the shop just in the nick of time, it could still be repaired rather than be fully replaced. I bet you would not want to spend big bucks on replacement right away. 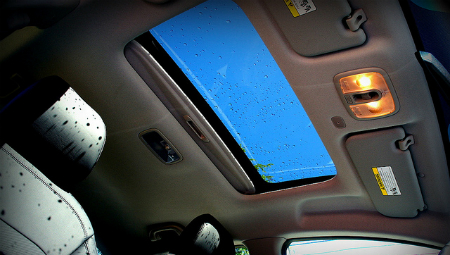 If you notice some moisture or water coming in from your sunroof, have it checked right away. This could be due to a number of reasons but the most common is a problem with the rubber gasket or the glass itself. If at one point your sunroof’s mechanism malfunctions, and by malfunction I mean a change in how smooth it opens and closes, then have an expert check it right away. Be proactive, do not wait for it to totally stop working before you have it checked. Remember that there is nothing better than a symptom treated early than a sickness being cured.